NEW! BUFFALO BILL'S BIG VENISON OLE' SMOKY STICKS! 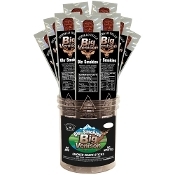 Buffalo Bills Big Venison Ole' Smokies are available in 1.5 ounce sticks.